A postgraduate student of the University of Lagos, Jimi Fatunbi, has been allegedly injured by two lecturers at the university campus, Owojela’s Blog reports. 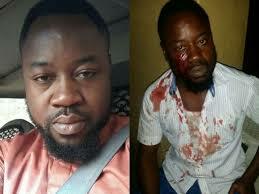 Fatunbi told the Media on Friday how he was slapped and stabbed by the lecturers at about midnight on Wednesday. He identified the lecturers as Dr.BabawaleTaiwo and Dr. Israel Abiala, who lecture at the Departments of Mathematics and Statistics; and Arts and Social Sciences Education respectively. It was gathered that the incident happened at the UNILAG’s Faculty of Education roundabout. Fatunbi, studying for masters in English Language, is a resident of the Henry Carr Postgraduate Hall. He explained that the incident, which started out as a conversation turned bloody when he alighted from his vehicle to complain about how one of the lecturers banged on the body of his car. He said, “I went to take my car from Elkanemi hall, where it was initially parked, to Henry Carr. While I was reversing at Elkanemi Park, I discovered that a vehicle was behind me and the occupants (lecturers) of the vehicle said I was obstructing them. When the Media visited the university campus on Friday, security officials at the Alpha Base (the university’s security house) confirmed that the case had been reported. When Punch contacted on the telephone, the Public Relations Officer of UNILAG, Toyin Adebule, also confirmed the incident, saying the management had been notified. He said, “I have confirmed it myself. There is one Dr.Taiwo involved and the case was reported at our security post. The attention of the management has been drawn to the case and we are taking action. It is still under investigation.